Our first Church Micro, situated in Clay Cross. Can be done whilst attempting our Miners Memorial cache. This is a short puzzle cache which should only take a few minutes. There's limited parking on nearby side streets but there is free parking off Holmgate Road where you can also do High Cross (GC3KGWV). This puzzle should be pushchair friendly though wheelchair users may find it difficult as there are steps to navigate at the church. 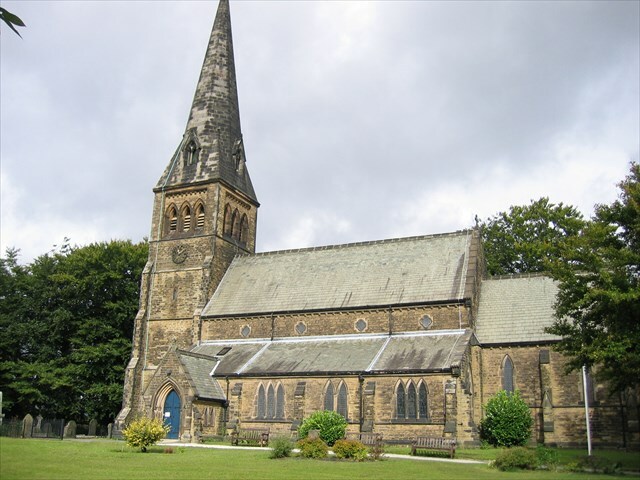 St Bartholomew's was built in 1851 and it was Joseph Oldham who was the first vicar of the church. However, he had to wait until 1857 before the church finally got a spire. It's six bells were installed in 1874 and were completely refurbished in 2001. The land on which St Bartholomew's sits was donated by George Stephenson & Company, with the church also having links to the local mining community - in 1879 a stained glass window was installed in memory of the engineer who created link motion in locomotives, William Morris. The church has had many additions and improvements thoughout it's history. It's original organ (1864) was relocated in 1953, and was completely replaced in 1995. The original stone roof was replaced in 1896 with green Westmorland slate, and in the early 1990's the roof was completely replaced. Burials in the graveyard ceased in 1878, with the church now using the nearby Danesmoor cemetry. The given coordinates lead you to a memorial at the entrance to the churchyard. Go up the steps into the churchyard and you will find the remains of the original stone cross that stood in the town, which gives the town it's name. At the base of this is a plaque. You'll need to examine the inscription to get the final coordinates. The cache is not located on church property or within the grounds nor is it located on private property. Please replace as found.